We hope everyone had a great time at Pixar Party and PinCon World pin trading events this past weekend! Here is a look at the new pin releases this week. 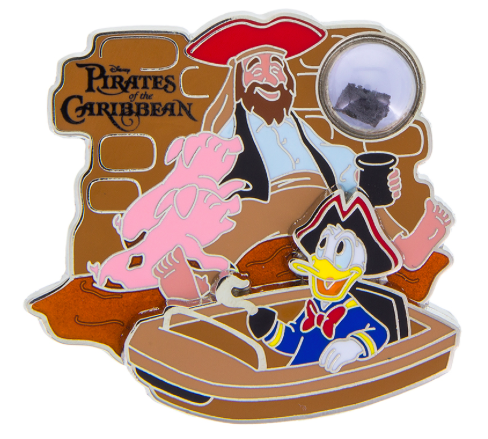 Piece of Disneyland® Resort History – Pirates of the Caribbean: This PODH pin at Disneyland features Pirates of the Caribbean! It contains a piece of the ride vehicle. Limited edition of 2,000. Available at DLR on September 1, 2016. Disney Vacation Club Member Exclusive: Compass Collection: Stitch: This is part of the DVC compass collection pin set! The third pin features Stitch. It is a hinged pin that is limited edition of 2,500. Available on September 1, 2016 at both Disneyland® Resort and Walt Disney World® Resort. 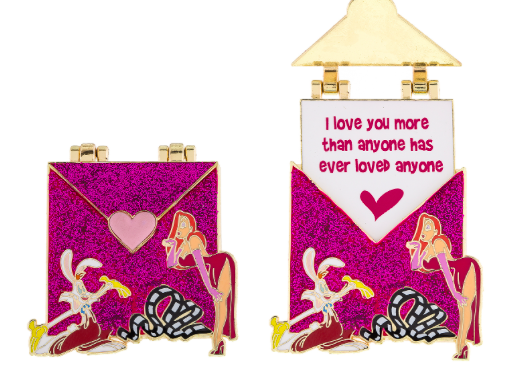 Love Letters Pin of the Month: Jessica Rabbit: The August Love Letters Disney pin features Roger Rabbit and Jessica Rabbit. Limited edition of 3,000 and the retail price is $15.99. Hinged pin featuring glitter embellishments with a slider element. Available at Disneyland and Walt Disney World on September 1, 2016. 3. 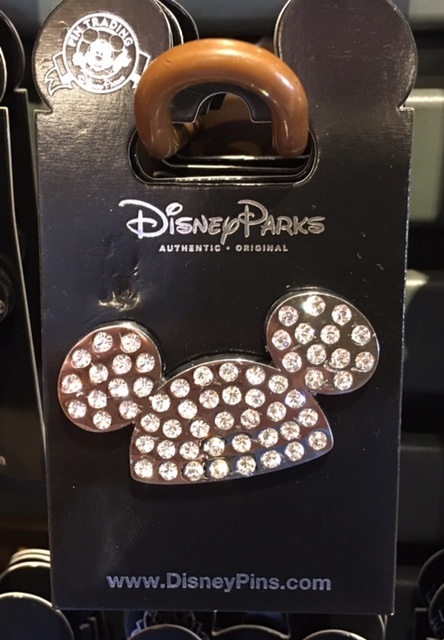 Jeweled Ear Hat Pin: New open edition Mickey jeweled ear hat pin at Disney Parks! Retail price is $12.99. 4. 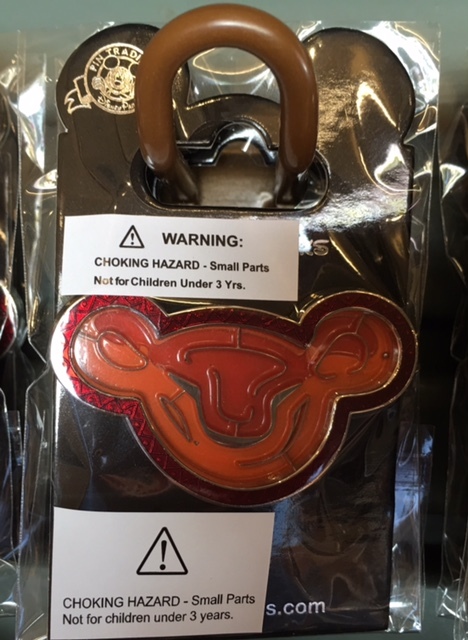 The Lion King Maze Pin: New game piece Disney pin spotted at WDW! It is a Lion King maze pin and should be available on both coasts. 5. 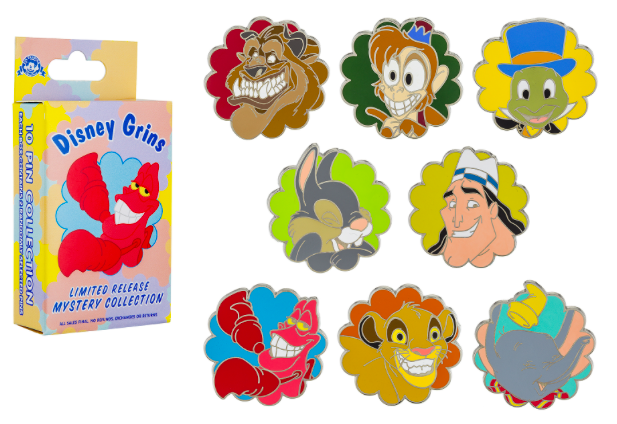 Disney Grins Mystery Pin Set: New Disney Grins mystery pin collection arrives at Disney Parks! This limited release pin collection features various Disney characters with a grin on their face. There are also limited edition chaser pins. Available at DLR and WDW on September, 2016. Which love letters have been released? Is Tiana out yet? All of the Love Letters to date have been posted. Just search “Love Letters” in the search bar to view them all. No, I don’t believe Tiana is out.